The Leave tab lets you enter the leave allowance for a new user. You can enter the user's leave allowance in days or hours, according to your preferences. If you use accrued leave, simply choose Accrue and enter the % they receive. 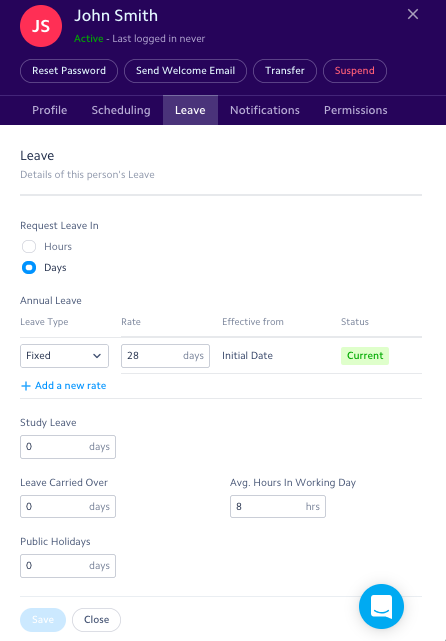 You can also enter the amount of leave carried over, the average hours in a working day (which will be set up as 8 by default) and the number of public holidays the user is entitled to. Once completed, press Save and Close to save the information.